GET EASE-OF-USE & CUTTING POWER WITH BobCAD-CAM. SEE FOR YOURSELF. Tech Tuesday is a weekly blog that addresses some of the most common questions and concerns that I hear throughout the previous week from users of BobCAD’s CAM software. Both customers and future customers are more than welcome to leave a comment on what they would like to see covered for the following Tech Tuesday. 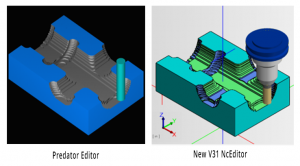 This week we are going to cover the Standard NcEditor in BobCAD-CAM V31 (replacing Predator Editor). Thanks in large to us working hand-in-hand with ModuleWorks, BobCAD-CAM’s new NcEditor is a step into the future of modern manufacturing. Our new editor, just like Predator Editor in previous versions, comes standard in our CAM software & is available for upgrade (Pro NcEditor). As our longtime users may be familiar with in previous versions, Predator Editor was basically just Notepad with DNC capabilities. So, what happened when people wanted to use syntax highlighting or adjust feedrates, and spindle speeds without having to search through the code? You needed the Pro Editor from BobCAD. Put that in the past with V31; in the new NcEditor, all of this and more is available in the Standard version! Admittedly, our old editor had a few drawbacks. In the new NcEditor, users are equipted with an intuitive user interface called the Job Setup. The job setup, which is set automatically when launched from BobCAD-CAM allows you to also easily set up older programs by allowing you to create a new job setup to use, save job setups to use later, select a machine, assign a target part & set its color and assign stock geometry & set its color. We couldn’t be happier to offer our customers a standard editor with more features that are easier to use. With all of this power, the new NcEditor will make verifying, and backplotting g-code easier than ever! Thank you very much for reading Tech Tuesday. To get articles like these delivered directly to your email, make sure to subscribe using the form above! See you next week! Have questions? Call us at 877-838-1275. You’re one click away from subscribing to BobCAD’s YouTube channel. Click the link below for tips, how-tos and much more! Very informative about NC editor. Several available options I haven’t tired yet. Glad you liked it! Yes, many good things in the Standard and Pro versions of our new NcEditor. Please describe in 50 words or less what you are looking for in a CAD-CAM System. Best time to call to schedule your personalized demo? BobCAD-CAM values the privacy of all visitors. © 2019 BobCAD-CAM, Inc. All Rights Reserved.